Art Pottery can be seen as something of a catch all term when it comes to ceramics. However, whilst a gross over simplification, it refers generally to pottery (though can include porcelain) that is made for aesthetic or decorative purposes though it may, of course, still retain its functional use. It includes vases, tiles, tea and table wares and decorative figures. It was produced loosely from 1870 up until the First World War. 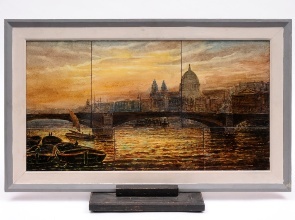 A Doulton Lambeth tile panel for the 1893 Chicago World's Fair by Esther Lewis. The fact that art pottery was produced both by smaller artisanal potters and the larger factory concerns alike over a significant period of time means that it can take many forms - from the brightly glazed majolica (not to be confused with maiolica) of George Jones, Minton and Joseph Holdcroft to the equally bright but more naturalistic (and sometimes garish) Portuguese Palissy Ware. 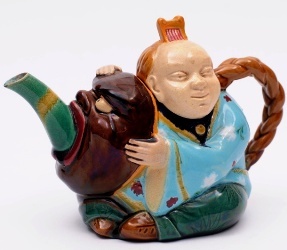 A Minton majolica 'Chinaman' teapot, circa 1877. Of the larger concerns, Minton deserves a mention for their partnership with the government and London art schools to form the appropriately named Minton Art Pottery Studios at Kensington Gore, but it was Doulton Lambeth/Royal Doulton that was the powerhouse of English Art Pottery. 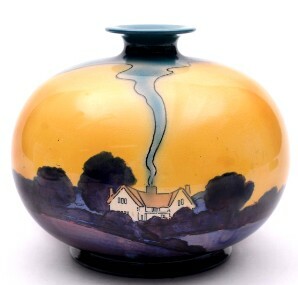 Their list of top notch potters and designers is extensive with modellers such as George Tinworth, Mark V Marshall and Leslie Harradine; and decorator-designers including Frank Butler, Charles Noke and a bevy of talented women that included Hannah Barlow, Florence Barlow, Eliza Simmance and Emily Stormer amongst them. A Wileman & Co Pastello Ware vase designed by Frederick Rhead. Staffordshire is equally well represented by the Rhead family (especially Charlotte Rhead and her father Frederick Alfred Rhead) who produce very fine tubelined tiles as well as thoroughly commercial but attractive vases and bowls. There is Bernard Moore, greatly influenced by the Orient and a master of glazing, and close by there was the Bretby Pottery. 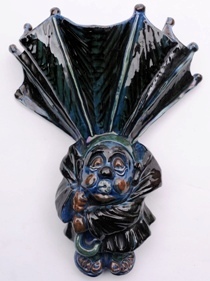 A CH Brannam Barnstaple wall pocket by Thomas Liverton, circa 1903. The West Country geology and clays favoured Art Pottery with CH Brannam's Barum Pottery in Barnstaple and in the south of Devon the Torquay Potteries, in Clevedon there was Sir Edmond Elton's Sunflower Pottery and across the Bristol Channel the Ewenny Pottery. Heading east, there is of course Poole Pottery. In London, there was Richard de Morgan, Essex boasted Edward Bingham's Castle Hedingham Pottery; and further north William Howson Taylor's Ruskin Pottery, which operated out of Smethwick. In Birkenhead, there was the Della Robbia Pottery and Manchester boasted Pilkington's Royal Lancastrian and further north still Leeds had their Burmantofts concern and Middlesbrough had Linthorpe. 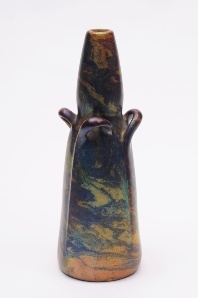 A Zsolnay Pecs Labrador Eosin vase, circa 1900. The list may seem comprehensive, but really is just a hint of the rich and patterned patchwork pottery heritage of England during the Art Pottery period and each one has a story to tell in its own right. For those of you that are wondering what has happened to the Martin Brothers and Moorcroft, they are an intentional omission that deserve a more fulsome mention elsewhere and, of course, there is the question of other notable Continental makers such as Hungary's Zsolnay Pecs and Czechoslovakia's Amphora, Austria's Goldscheider and any number of admirable French concerns.